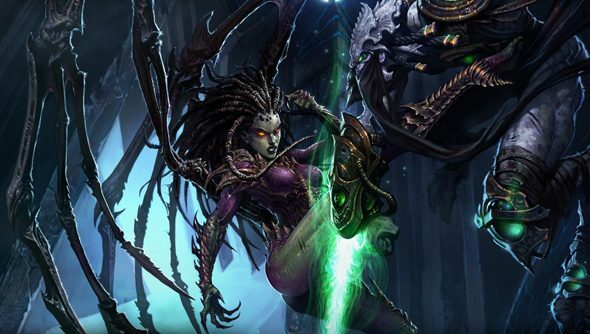 During a panel about eSports at the Valencia eSports Congress, Dustin Browder, Lead Designer on Starcraft II, was asked whether Blizzard had any plans for free to play in regards to their strategy behemoth. Free to play opens up the game to a huge number of people, and the more people that play, the more likely it is that you’ll unearth talent for your pro eSports scene. His answer? Blizzard are ‘looking at free to play as an option for the multiplayer’. That’s not a confirmation, but it’s potentially huge, if Blizzard wanted to make that jump. If you look at the rest of the eSports scene, Starcraft II stands alone as a fully priced product, with League of Legends, Dota 2 both being free to play, and even Counter Strike: Global Offensive carrying a reduced price tag. The wider your audience, and the more people playing your game, the more people will be interested in watching your pro players competing in it. The main thing holding Blizzard back at the moment, at least according to Browder, was the logistics on how it would work. “We don’t know how we would monetise it. While it might be good fun for me to play against someone with only half the units available to them, that’s not going to be an enjoyable experience for them.” It’s a valid concern, especially when Starcraft II itself doesn’t exactly lend itself to being nearly as modular as League of Legends, Dota or World of Tanks. Either way, I’d be incredibly surprised if it happened before all three installments of the game were released, at the very least. Especially when there’s so much refinement and tweaking for them to do with each one, trying to attach a whole new payment model on top of that would be lunacy.